Elizabeth Irvine is an educator, award-winning author, and the creative director of The Jewelry Project. Elizabeth’s philosophy and teachings are based on twenty-five years of experience as a healthcare professional and through her yogic style of living. Irvine’s books, Healthy Mother, Healthy Child and A Moment’s Peace provide women and families with a calming and healing influence and a simple guide for bringing peace and serenity into the home. In 2011, Elizabeth pursued the idea of providing a tangible keepsake for women. Her most recent book Meditations From the Earth pairs affirmations with the gemstones that complement the jewelry line. The collections are all handcrafted with high-quality, semi-precious gemstones, crystals, and raw materials that are timeless and classic. A percentage of the proceeds from The Jewelry Project support charities for women and children and they are currently sold in specialty stores across the nation. 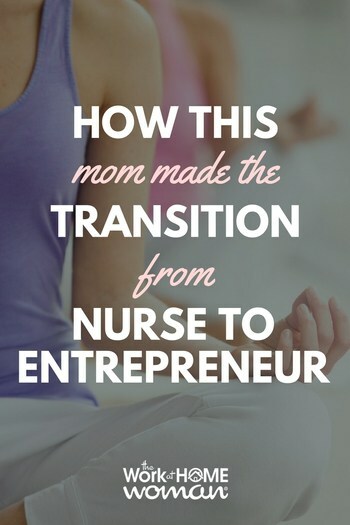 Read on to see how this mom made the transition from nurse to entrepreneur. I never really thought of myself as an entrepreneur. I was just a woman who wanted to pass on knowledge and creatively express myself. My son’s childhood illness pushed me to find a way to help him and learn how to deal with my own stress. That experience was my portal to digging down inside of myself and get in touch with the best part of me. Then the drive and the motivation to do my work came forward. What did you do before making the leap? Before becoming a business owner, I worked as a registered nurse in pediatrics and took care of our three small children. Slowly evolving. Over time finding a dedicated team of people to help me. Gradually allowing things to unfold and learning how to be patient with the process. Providing education plus a meaningful product has been rewarding and successful. Our team now includes my daughter Sarah. She joined us after finishing her bachelor's degree last spring. As a mother, this is a dream for me. She is our marketing director, and she is developing our presence online. She is a joy to work with. We laugh a lot and try to keep our work ethic light and fun. What is the biggest mistake you see new entrepreneurs make? Go for it! Owning a business is the most exciting, liberating, rewarding, creative thing I have ever done. I take a break and shift things up. Go for a walk, get something to eat, etc. knowing that we've helped others improve their lifestyle in some way keeps me going. If we are spreading good vibes through one of my books or a workshop or hearing a woman say she feels beautiful wearing a piece of our jewelry, I feel we are making a difference in someone's life. This feels good. A great motivator to keep on doing our thing. I endeavor to practice what I preach and take care of myself. I dedicate time each morning to my yoga and meditation practice, which I feel is one of the most valuable things I can do to set the tone for the day. My days are very full and rich. I think the secret is to love what you do. I believe we are supposed to be happy in our day-to-day life. I am constantly reflecting on “did I enjoy doing that ?” If I don't enjoy doing something, I ask someone else to help me with it, or we look for a new way to change the direction.